Here is my original mood board I created for the space. I think I pretty much stuck to the plan. What do you think? 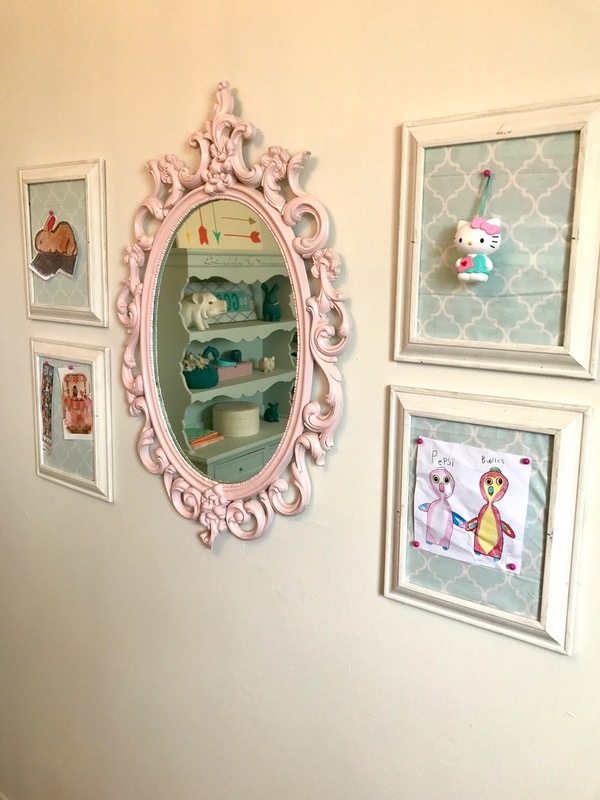 This is the smallest bedroom in the house, so I wanted to make it extra special for my smallest girl. Remember on Week 1 where I told you what her request for her room was? 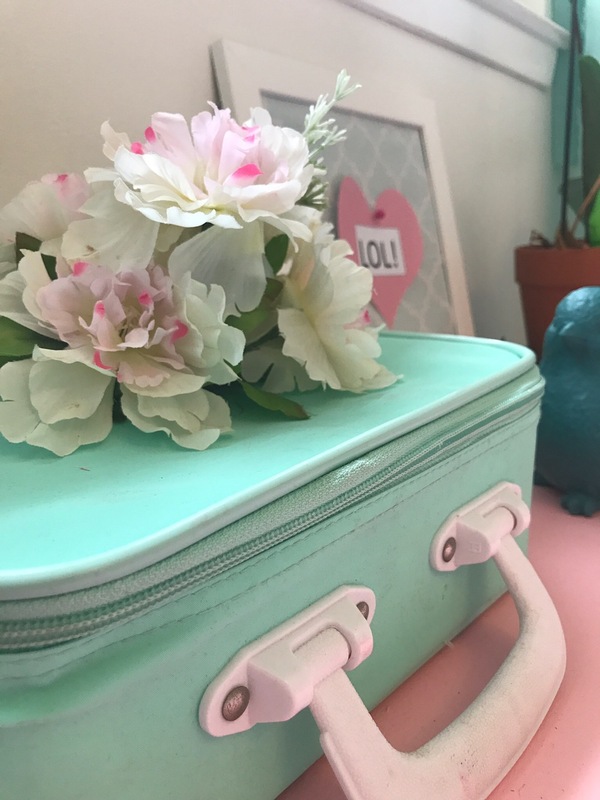 She wanted a room that was “not too girly, but a little tom-boyish, but a bit girly, with pretty things…” So, how did I do? I’m calling this design “Preppy, Modern, and Stylish”, and I LOVE it. More importantly, my daughter does too. 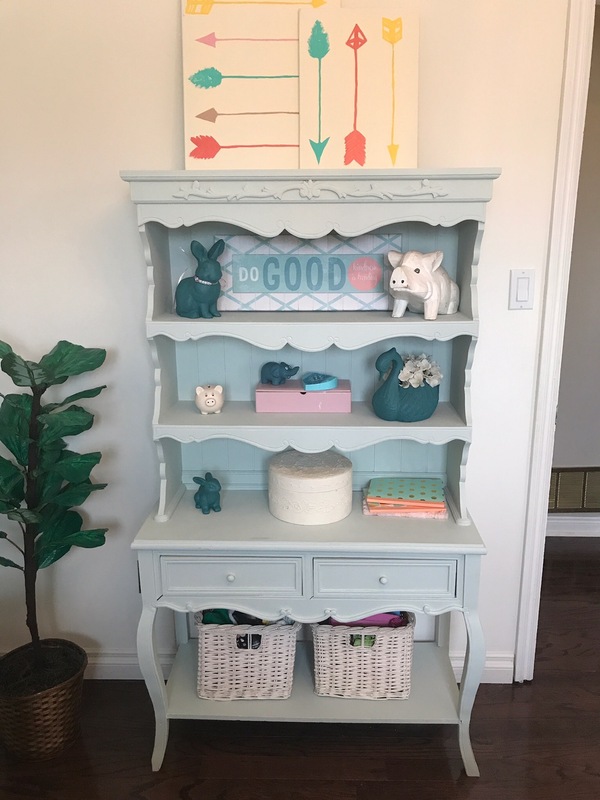 I was excited to be able to re-purpose many of the furniture pieces I already had, such as the dresser, the storage ottoman and hutch shelf. This gorgeous comforter and pillow sham were the inspiration for the whole room. I just adore the jewel toned green, mint and coral colours. They are just so happy and fun. 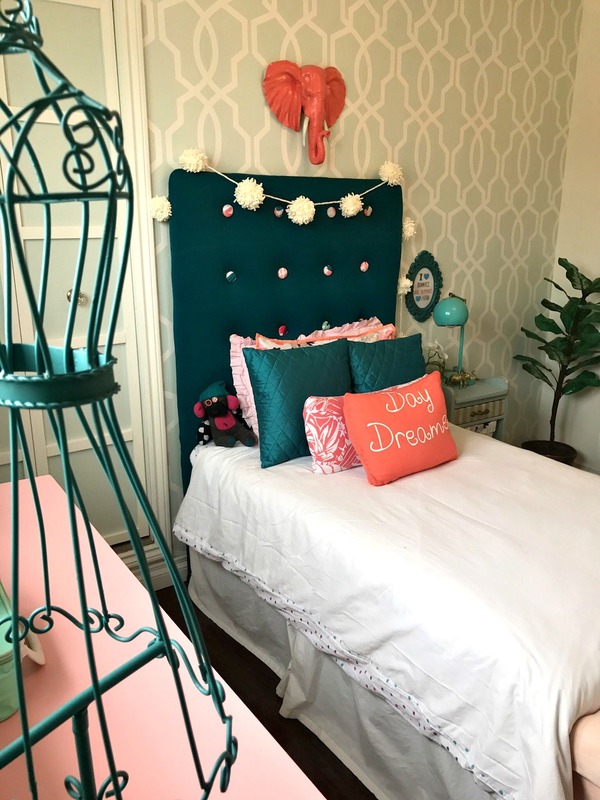 I picked up so many great finds at thrift stores while shopping for this room, including this awesome retro modern style lamp, along with two queen size flat sheets that I used to sew the duvet cover and two t-shirts I cut up and used to make throw pillows. The green jewel toned pillow covers were also a thrift store find at $1.99 each!!! How perfect are they? The thrift store gods were certainly looking down on me that day. I’m not a huge fan of the night table, but until I can find a pretty mirrored piece that is also affordable, it’ll have to do. Here’s a quick peek back at how the room looked 6 weeks ago. It was cluttered and messy, and wasn’t suited to a growing 8 year old. It was a hodge-podge of leftover stuff previous rooms I had done and never had a cohesive look. 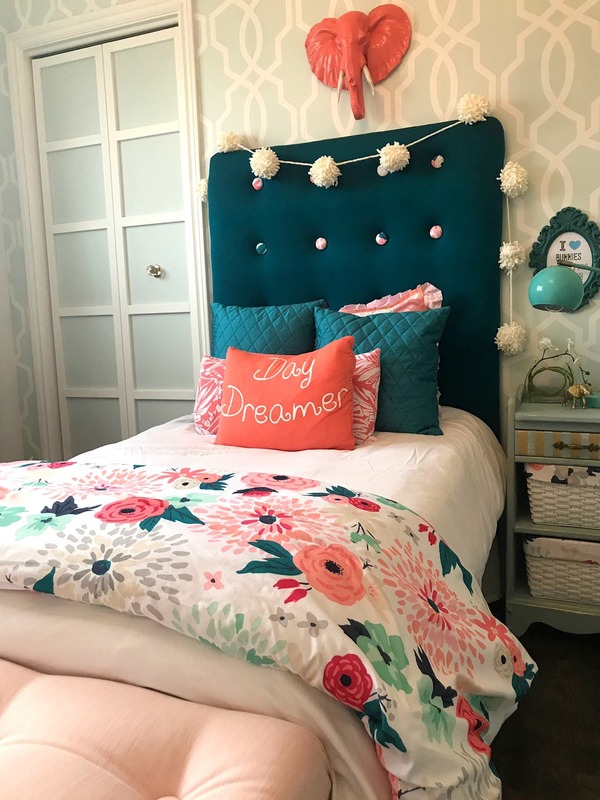 I really wanted a room that she could call her own and could easily be made into a more mature space simply by changing out the throw pillows and some of the decorative accents. 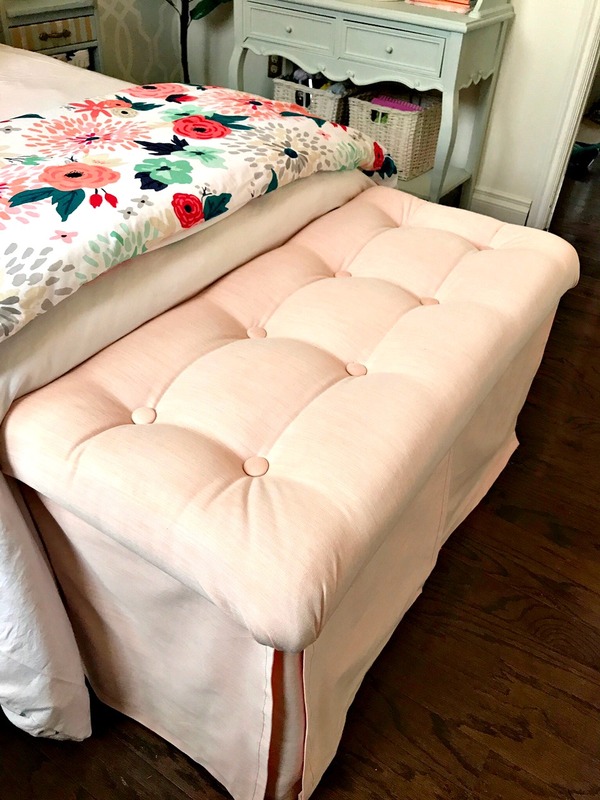 Would you believe me if I told you I completely transformed this storage ottoman for $9.00? I found this pinky coral fabric on clearance at my local fabric store since they were moving to a new location. It cost only $1.50 / yard, so I grabbed six yards. Crazy right? I could hardly believe it when the cashier told me the price. Here is my inspiration pic. It’s stunning, right? Go check out Four Chairs Furniture & Design to see more of their fabulous design concepts. Would you believe that these pillows used to be thrift store shirts? Look closely… you can see the neck hole on one of them. This fun little art galley display wall was refreshed with some new fabric in a mint colour that mimics the wallpaper. I’m going to add a few more frames down the road, but until then, this is fine. I’m in love with this new chalk spray paint I picked up. It’s a wonderful fast drying spray with a matte finish. I’ll definitely be using this again in the future. Thank you again so much to Linda from Calling it Home for hosting this fabulous biannual event. 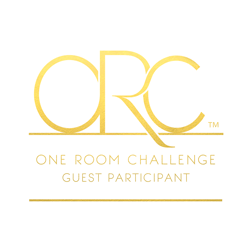 It’s been a lot of hard work, but also a pleasure to have taken part as a guest participant. I really can’t express how beautifully this room is turned out. It is simply amazing. Wonderful work done by you. Everything is awesome. I loved the retro modern style lamp. This is a beautiful room. I have a daughter that loves all of these colors as she is not a pink girl. Thank you for all the great ideas. This is adorable! 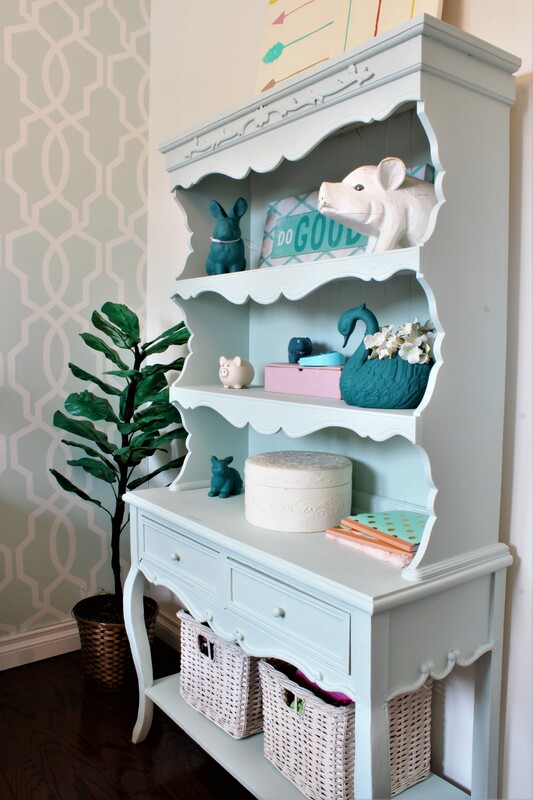 I adore the colors, and I love the hutch. Such a cool piece! 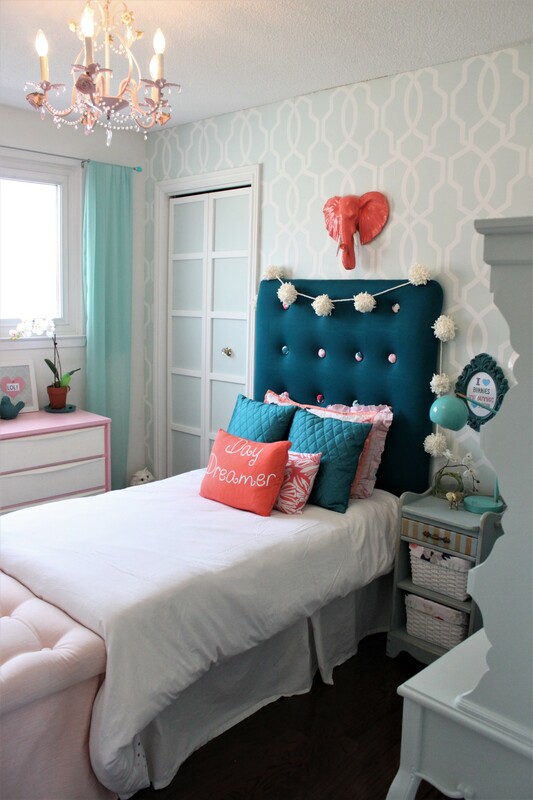 What a great girls room! The entire room is gorgeous! 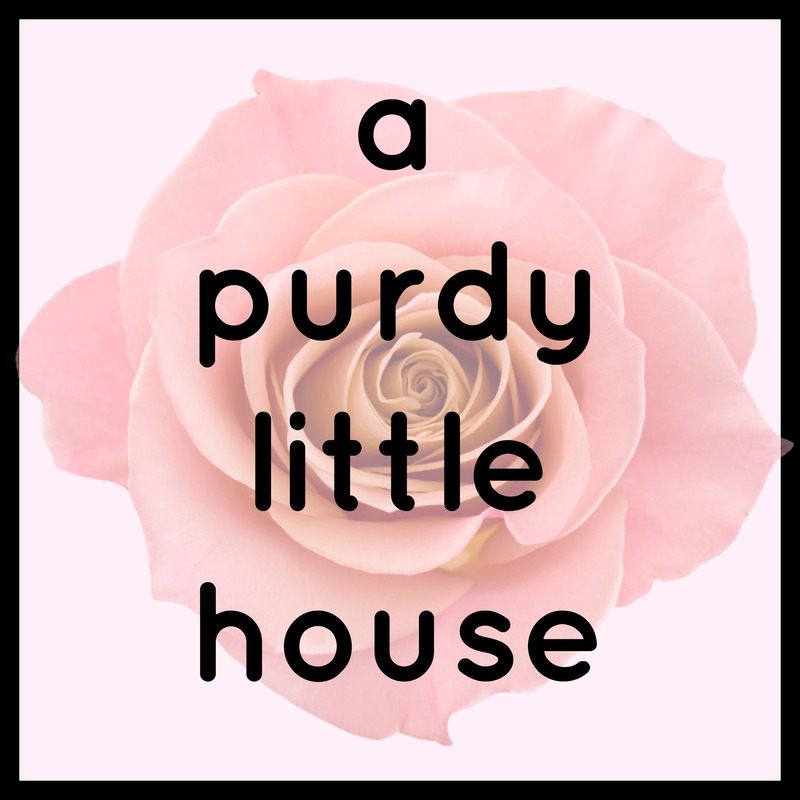 It’s so fun and whimsical for your little gal! I love the wallpaper and the elephant. The flowered pillows are pretty great too, I bet she’ll love this space as she grows up. 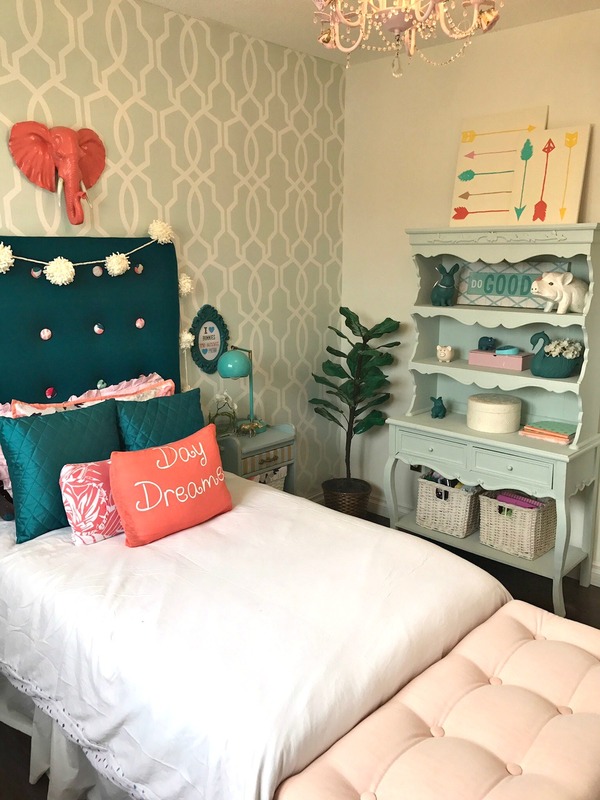 This is magical!The room now looks spacious,neat and lovely.I can’t stop drooling over the orange elephant head.From where did you get it? 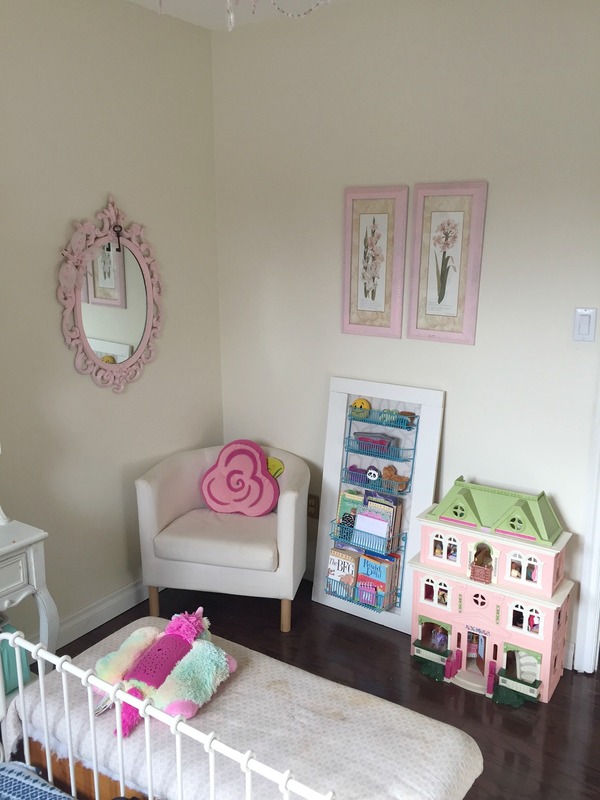 Such an adorable room for your little girl. I really love the wallpaper design and print on the bedding. oh i love this! the color combo is awesome! 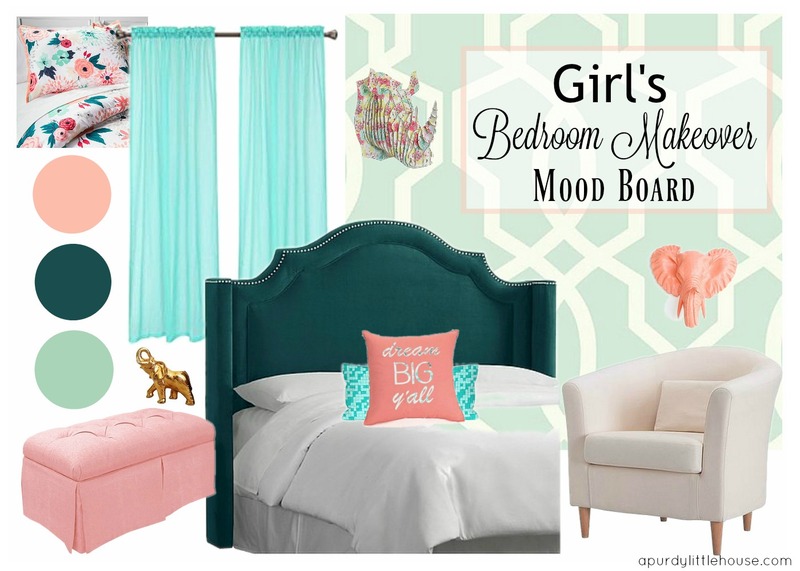 what a happy space for your girl! Looks great Sue! Love all the colors and the personal touches. Nicely done! 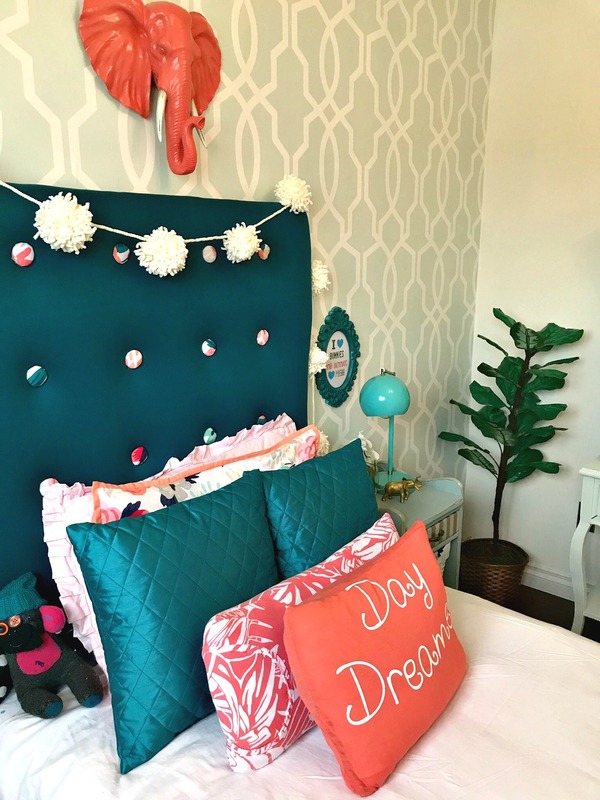 Such fun, pretty, and fantastic girl’s bedroom, Sue! I love all the colors! 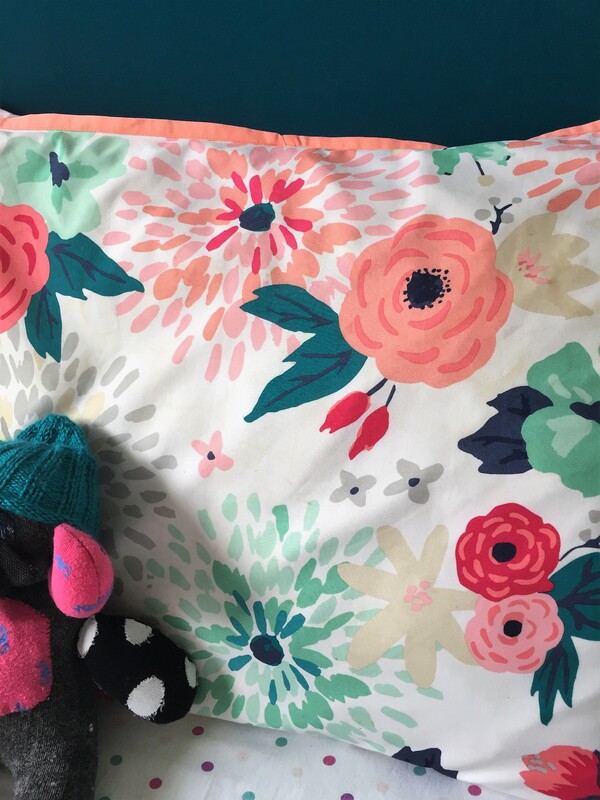 Thrift store shirt turned pillows — how smart! 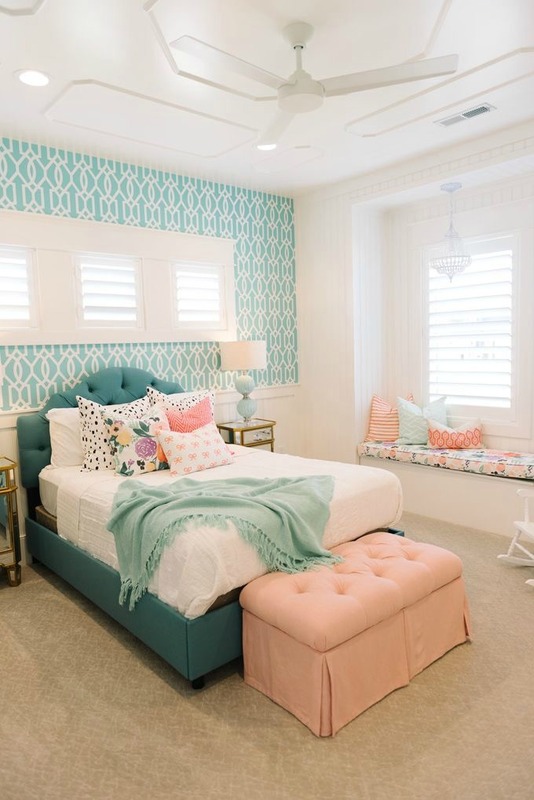 Congratulations on completing such a pretty room for your daughter. She must be so happy! This looks amazing!! 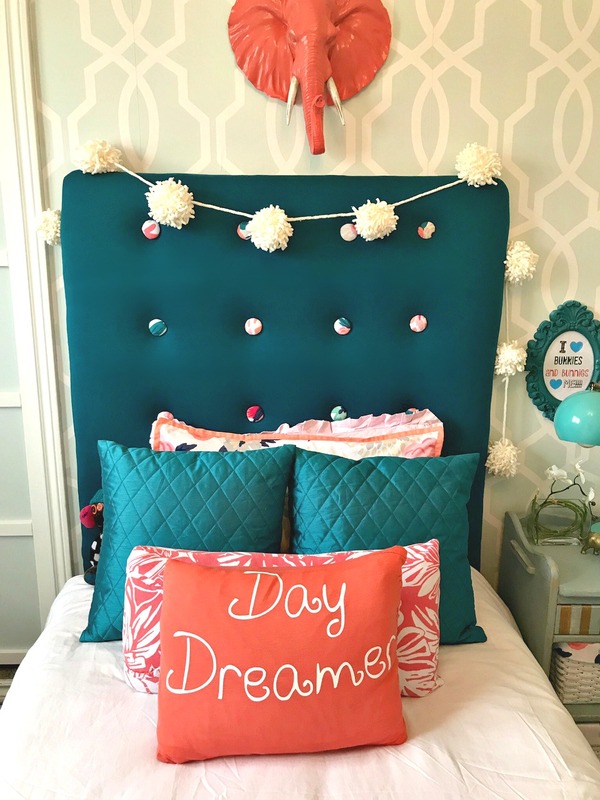 I love love love the pillow sham, what a great place to start as inspiration! Holy Cow! 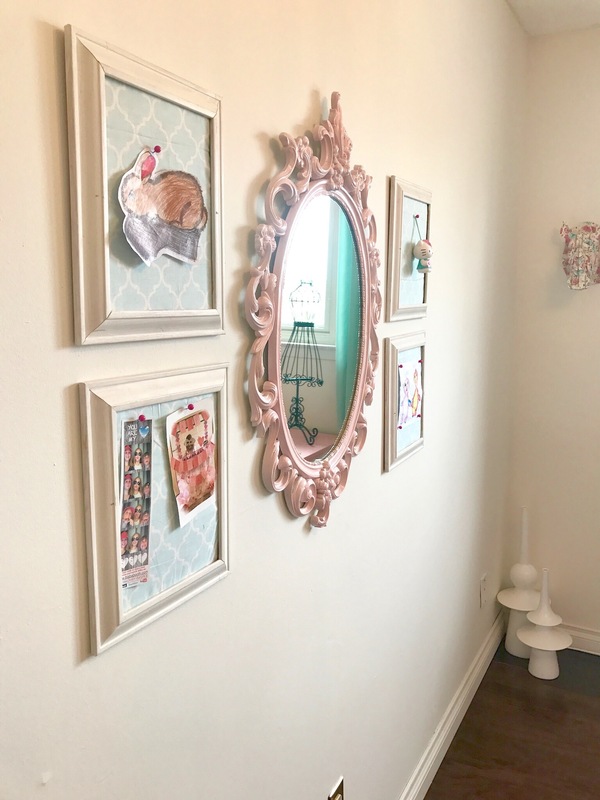 This is the best girls room I’ve seen in a long time- just one question- can I live here! ?